The second question is probably the more important one to answer these days. Basically, it is perfectly safe in the Middle East right now, save for visiting Syria or Libya. Even during the revolution in Egypt back in February of this year, the Red Sea tourist towns, like Dahab, were completely safe places to visit. In fact, you could have gotten some amazing deals here in February and March, because tourism ground to a halt. 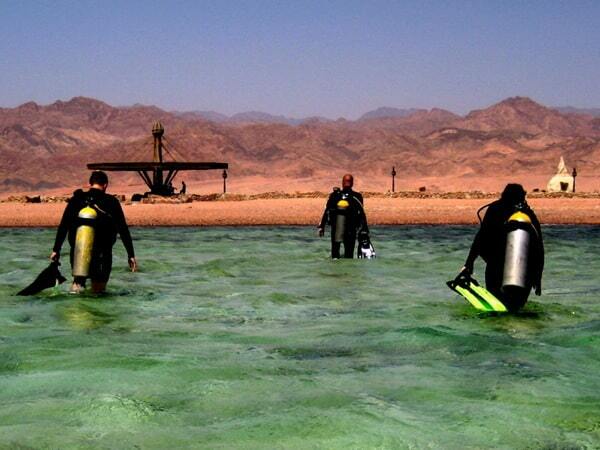 And there are so many things to do in Dahab which make it worth your while to go. In any case, it is completely safe now (as is Jordan and Lebanon, which I’ll be doing more writing about soon). So why Dahab? There are so many things to do in Dahab worth your while… and so many reasons to hit this little town on the Red Sea. I like a good deal as much as the next long-term traveler, and Dahab is one big deal. I am staying at Red Sea Relax Resort and you can’t do any cheaper than this… free dorm room there if you are diving. I am. I’ll be here a month. And I won’t pay a penny for lodging. There are also a variety of private rooms there also and I’ve taken a look at them and can say they are great. It gets better, unlike the majority of Dahab Hotels, Red Sea Relax offers a free gym, yoga classes, as well as free wifi and an extensive free breakfast. I’ve been quite happy with this as my current base of operations. I am not the most experienced diver in the world, but the Red Sea is one of the best locations I have been able to dive in. The coral is still in good shape, the fish life is excellent, the famous “Blue Hole” is nearby — there are plenty of good diving reasons to base yourself here. And not to go back to the previous point, but let’s talk price again. 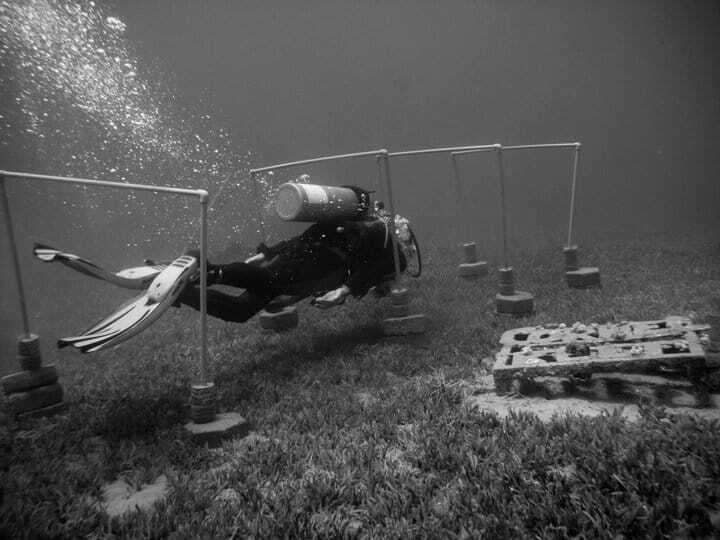 Most places I have dived cost about $100 (U.S.) for two dives and sometimes doesn’t include your equipment rental. At the Red Sea Resort Dive Shop, you can get 10 dives for about $330 in current exchange rates, so $33 per dive, all equipment included. I was also able to negotiate a little reduction on top of that, because of the current downturn in tourism. Bet you didn’t see that one coming. One of the things that I adore here is the negotiation over your dinner, if you go to any of the dozens of restaurants that are perched right at the edge of the water. Every night when you walk by their are guys out front asking you to eat there (in a friendly way that somehow doesn’t put you off like it does in some places). They all have menus and set prices… but it is all negotiable. So you walk up and tell them what you want. “How much for a kilo of calamari, some bread and hummus, and perhaps that fish (you point to the fish displayed on ice right out front in a case)?” Then you go back and forth. I’ve never negotiated for dinner before, but it is sort of addictive. And so I need to repeat this again… cheap. There is a lot more to say about Dahab and Egypt — and the Middle East in general. Lucky for me that I’ve got notes enough for another couple dozen posts on this part of the world, which is one of my all-time favorites. Postscript: Photos from Chris, the great owner of Red Sea Relax Resort. And if you want to book a room here (not just a dorm room, but any variety), please click through the button displayed below. I get a small percentage of any bookings via Hostelworld, which helps offset some of the costs of this blog and helps keep be traveling and writing… which I hope you are enjoying. Great post on Dahab. I know countries like Egypt and Jordan are really pushing tourism right now. Seems like a great time to visit too. It’s too bad the Middle East as a bad reputation and isn’t as stable as other areas as there are some great places to visit. The more I read about travelers who go there, the costs, and the great places to see, the more I want to visit there as well. Living here in California, I’ve met quite a few people from there which makes me even more interested. like many “dangers,” Americans overrate and generalize a bit too much. Jordan has been fine though all the stuff this year. As has Lebanon. The issues in Egypt were mainly just in Cairo, Suez and Alexandria (none of it hit out here) and have been over for months. Too bad… people are missing out on some deals here now. Are you in Dahab now? thanks for the diving tips! I RT’d them and am going to sit down and check them all out. I will pass the complement on to Chris. He’ll be happy to hear it, I’m sure. I’m still waiting on MY great sunset shot! Nice post, Michael. I so want to go there. I’m sad you’re not doing your dive master, but kudos to you for making writing a priority! BTW: booked the samesun in Vancouver for TBEX. Can’t wait. excellent news on TBEX. We are going to have a blast! Even though I’m not a diver, I loved Dahab! I was there in 2008 and it was so laidback and non-touristy. And yes, cheap too! Are you familiar with the canyons outside of Dahab? I did a day trip to go hiking in the Colored Canyon and White Canyon while I was there and had a great time – highly recommend it! Can’t wait. Hopefully somehow I’ll get over my fear of water and get my scuba cert before we get there. And bargaining for dinner? Sounds fun! well, you should just do it here. Free place to stay while you do it. Good instructors. Great visibility. Good spot for it (and cheap). Love this post! Sounds like a relaxing, inexpensive beach destination. I was in Cairo for several days about a week ago, and it felt perfectly safe. Walking across Tahrir Square, I strained to see signs of revolution. It seems like the resort areas continued to attract tourists during the revolution by offering great deals. I’d love to return to Egypt and check out Dahab! Yea, personally I have felt the safest in the world in Muslim countries. I understand the “unsafety” of places like Syria right now, but in general, these are some of the safest places in the world. Wow I knew it would be nice but those photos are gorgeous. it is pretty, but for me that isn’t even the biggest draw. It is just so chill and relaxed here. “Dahab time” is a phrase you hear often here. This is very nice, I don’t know why I thought Egypt was expensive, maybe only very tourist areas are.. I have found it mostly to be a fairly inexpensive country. Not the cheapest, but certainly not expensive in my book. If you are willing to eat street food and local fare and stay in hostels… it can be done on a reasonable budget. Great post including amazing pictures! It is hard to know what the truth is about traveling to Egypt right now which is why I appreciate reading posts like this. I am not a diver but have heard nothing but good things about diving in the Red Sea. Egypt is totally and completely fine right now. If you can find a deal to come over right now, I’d jump on it. Dahab is on my RTW itinerary, I so can’t wait to get there!!! I have heard nothing but good things about it. Wow, you’re really selling it to me! Dahab is certainly is a marvelous place to visit, but mainly for adventurous travelers who like to explore new places, your post is so nice and descriptive. thanks for visiting and I agree — tons of great adventure here! This looks like a gorgeous place. I’m not big on diving, I usually like to stay above the water surfing and snorkeling, but this looks like a place I could spend a little time enjoying. excellent snorkeling here also, since the reef is just off shore. I mean JUST offshore. Very close. Thanks for writing such a great piece about our beloved hometown =) There’s a fair few of us here who meant to only stay for a few weeks… but are still here 6 years later! Glad to hear that you are headed for Jordan and the lebanon next. I visited a few months ago, in fact I stayed in Beirut for over a month. Both countries felt safe and I would return any time. Having been there I’m happy to endorse your trashing of Hurghada. Dahab is the place to be. We holed up there during the revolution: things got very quiet but the place was completley safe even then. I hope people are returning and business is picking up there now. Well, you sold me. 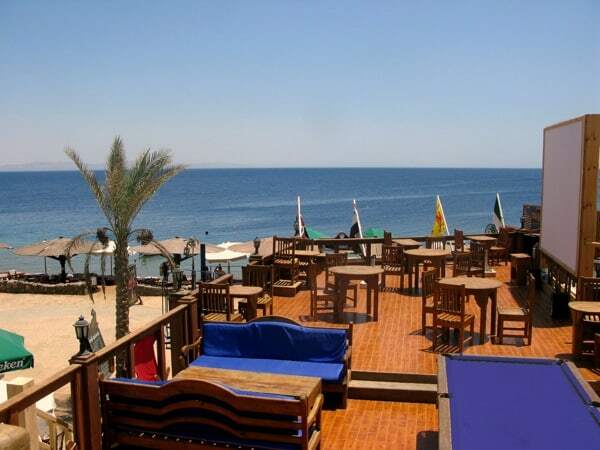 Next time I go to Egypt, I”m going to Dahab and staying at Red Sea Relax Resort. It sounds like heaven. If I ever get back into diving, this sounds like the best place to do it too. Thanks for the information and enjoy your time. I left another comment but it didn’t go through and thought I would try again with a different email. Thanks for the information on Dahab and the Red Sea Relax Resort. When we get ourselves back to Egypt, we are heading there. I may even take up diving again. With those prices how can I resist. Have a great time. Cheers. I’m wondering if the flies and cats bothered you when you were there. Perhaps it is a seasonal phenomenon, but we chose the restaurants that had enough incense (for the flies) and squirt bottles (for the cats). Myself and 10 mates just got back from Egypt and Dahab a week ago. No queues and no dramas – absolute bliss. Egypt has a great vibe about it right now! I wish you would have looked me up while you were here!! Good post on travel in general in Middle East and great photos! About bargaining for dinner prices – do you ever have that moral dilemma that I get when traveling to poorer places where I feel guilty about their circumstances and can’t bring myself to bargain? Some times I do and sometimes I don’t and it’s hard to know why, but it’s just a feeling I get about certain people or areas that guide my compass. Have a fantastic rest of your trip! Wow Michael, glad to hear this great review of Dahab! I was in Egypt just prior to the uprising and I was able to visit quite a few places in Egypt but had to cut out Dahab due to time constraints. I’m hoping to return to Egypt and spend some time just hanging out in Dahab! I lived in Egypt for a few year but sadly only visited Dahab twice (and only snorkelled). It’s a cool chilled out little town and I enjoyed my time with the locals. One day i’ll return. Totally worth a few weeks there, for those that want a relaxed and chill time.